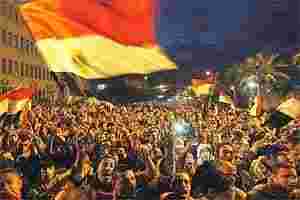 Cairo: Protesters demanding an end to army rule clashed with police firing tear gas near Egypt’s parliament building on Saturday in a flare-up that cast another shadow over a parliamentary election billed as the nation’s first free vote in decades. Protesters said one man, Ahmed Sayed, 21, died after being hit by a state security vehicle. His death was the first since a truce between police and demonstrators on Thursday calmed violence that had killed 41 people in Cairo and elsewhere. Egypt’s Interior Ministry said the vehicle had hit him by accident. The clash occurred after one group marched to parliament to protest against the army’s appointment of 78-year-old Kamal Ganzouri, a premier under Hosni Mubarak, as new prime minister. “Down, down with the marshal," a group chanted in the square, near tents set up on grassy patches. They were referring to Field Marshal Mohamed Hussein Tantawi, who heads the ruling army council and was Mubarak’s defence minister for 20 years. The military council said on Friday each stage of voting would be held over two days instead of one to give everyone the chance to vote. Voting starts on Monday but will not end until early January because of the election’s various stages. Tahrir protesters have dismissed Ganzouri, premier from 1996 to 1999, as another face from the past whose appointment reflects the generals’ resistance to change. “Why are they picking Ganzouri now? This shows that the army is unwilling to let go of any power by recycling a former ally. This government won’t have any powers, why else pick someone that is loyal to them?" asked protester Mohamed El Meligy, 20. Tens of thousands gathered on Friday to demand that the army council leave power now to accelerate a transition to democracy. Alarmed by the violence, The United States and the European Union have urged a swift handover to civilian rule in a country where prolonged political turmoil has compounded economic woes. The generals have resisted calls to quit now. Instead, they have promised that a new president will be elected by mid-2012, sooner than previously announced, and on Friday named Ganzouri to head a “national salvation government". Ganzouri described his task as thankless and “extremely difficult", saying his priority was to secure the streets and revive the economy. Egypt’s pound has hit a seven-year low and foreign reserves have dropped by a third since December 2010. While tens of thousands packed Tahrir Square for what activists dubbed “Last Chance Friday", at least 5,000 people demonstrated in support of the army in another Cairo square, highlighting splits between youngsters bent on radical reform and more cautious Egyptians keen to restore normality. Ganzouri’s appointment has reinforced that divide. “He is a very good man, he did a lot of good things. If he had continued in his role (in 1999) the situation would have been much better," said restaurant worker Osama Amara, 22. Protest groups have put forward their own demands for a government they want to be headed by presidential candidate and former UN nuclear watchdog chief Mohamed ElBaradei. They have also called for another mass rally on Sunday to press demands for an immediate transfer of power from the military to a civilian national salvation government. In Tahrir, shunned by main political groups such as the Muslim Brotherhood’s Freedom and Justice Party this week, some protesters said the vote should be delayed. The Brotherhood, Egypt’s best organised political force, wants the election to go ahead as scheduled. “Believe me, I don’t know who I am going to vote for," said Hoda Ragab, a 55-year-old woman at Friday’s protest in Tahrir, adding that elections should be postponed until calm returned.